4. f3 Anand is clearly playing for a win when he chooses this more complicated move. e4 tends to be a ver important square in such positions and the pawn on f3 exerts its influence there. 4…c5 Kramnik chooses a safer move than 4…c5. 5. a3 Welcome to the Saemisch Variation. This variation is highly theoretical and generally continues the way our current game does. 8…f5 Kramnik chooses not to play the popular 8…Qa5. 9…Nd7 Kramnik avoids the more common 9…0-0 10.e4 or 9…f4 10.e4 fxe3 11.Bd3. In placing the knight on d7 he prepares to move it to c5. 12. c6 Anand gets rid of a dead pawn by weakening his opponent’s pawn structure first. 14… Ba6 Kramnik wants to trade bishops so Anand no longer has the bishop pair. Anand could have also tried the exciting 15.Ng5 Bxf1 16.Rxf1 Nc5 17.Rf3. 16…Ng4 I really like this aggressive move. Kramnik proves to his critics that he does not always choose the most “boring” approach. 17…Qe3+ Kramnik also could have played 17…Qb6 18.h3 Ne3 19.Qd2 Bxc4 20.Bxc4 Nxc4 21.Qg5 Qe3 22.Qxe3 Nxe3 and black has good compensation. 21…Ndf6 Another aggressive move by Kramnik. Now his rook on d8 is much better but at the price of one pawn. 21…h5 is the solid choice Kramnik could have chosen. 27…e5 Kramnik is rolling now. 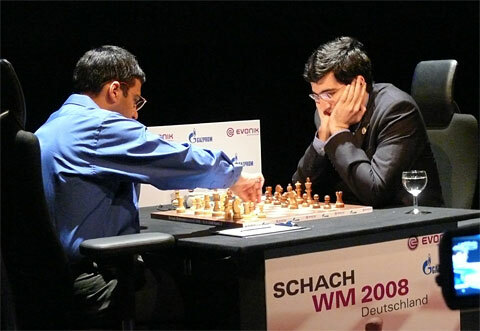 Kramnik’s pawn sacrifice allowed him to get his pieces to much better squares than Anand finds his pieces in. 31. Bc2 Anand misses 31.Rf2 Rh6 32.h4 Ne6 which seems better. 33. c5 Nf4 34. Re3 Bc4 35. Rb2 Rh6 36. Kh2 Rg6 37. g3 Nd3 38. Bxd3 Rxd3 39. 1. d4 Nf6 2. c4 e6 3. Nc3 Bb4 4. f3 d5 5. a3 Bxc3+ 6. bxc3 c5 7. cxd5 Nxd5 8. This entry was posted on October 17, 2008 at 3:55 am and is filed under 2008 world chess championship, Anand vs. Kramnik, World Chess News. You can follow any responses to this entry through the RSS 2.0 feed. You can leave a response, or trackback from your own site.